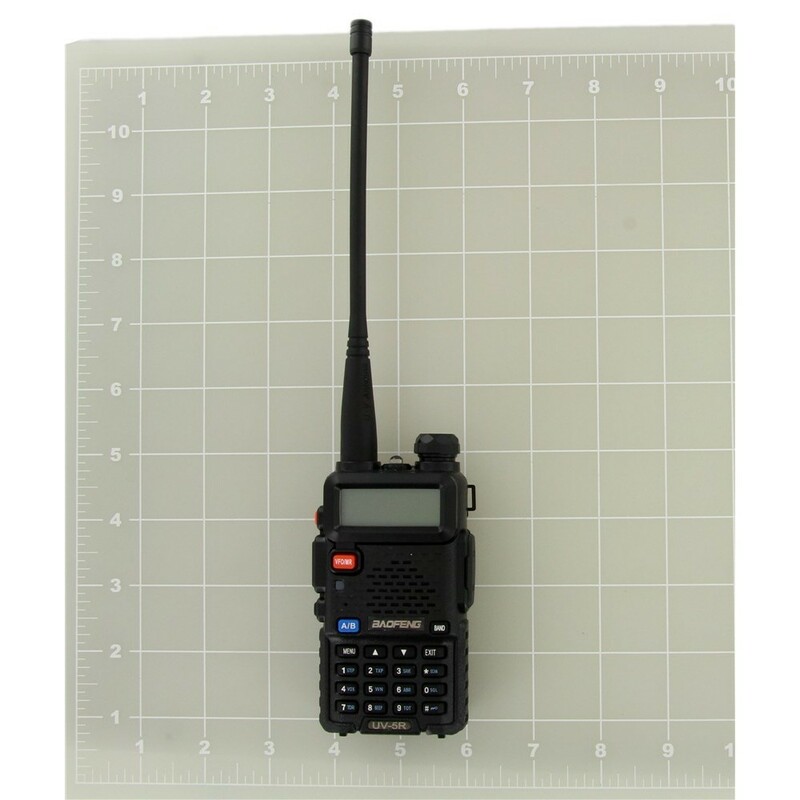 The Baofeng UV-5R is an economical Dual Band UHF/VHF Amateur Radio that's extremely compact. 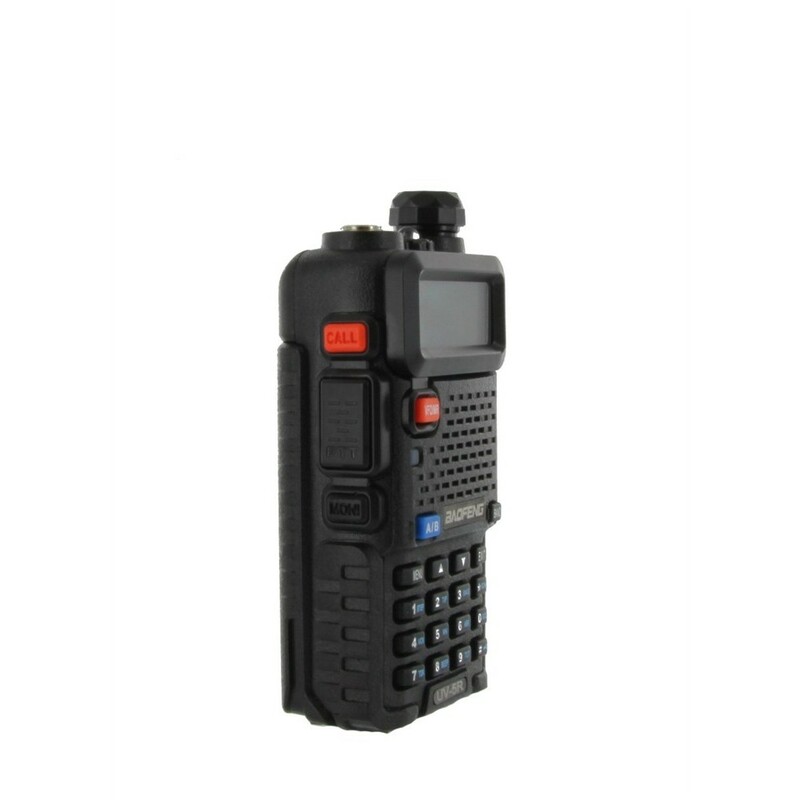 With 128 channel capacity and up to 12 hours of battery life, the UV-5R is a good choice for ham radio operators who need mobility at low cost. Upgraded with an A-V85 antenna! The UV-5R features 128 programmable channels with priority channel scanning, dual watch and 1750 Hz call tone. 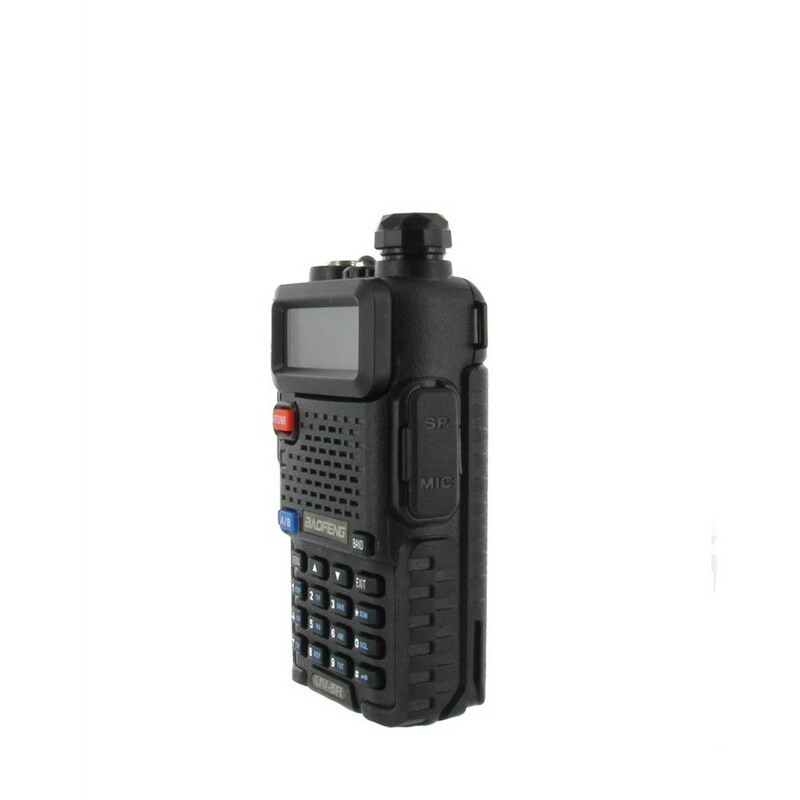 Other features include UHF/VHF Dual Standby, 65-108Mhz FM radio, Ani code, DTMF code, Dual display switch and CTCSS manual input. 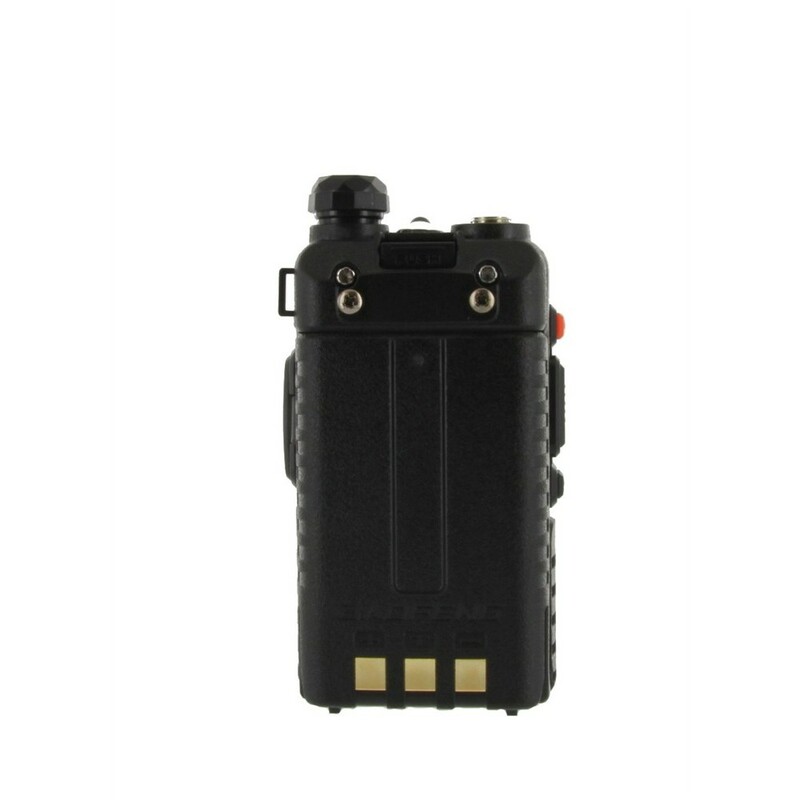 The UV-5R also features built-in VOX (Voice Operated Transmit) for hands-free operation and a high illumination flashlight. The Baofeng UV 5R has up to 4W of power and is powered by 1800mAh Li-Ion battery pack for up to 12 hours (approx.) of operation. A battery save feature helps conserve power until it is needed. 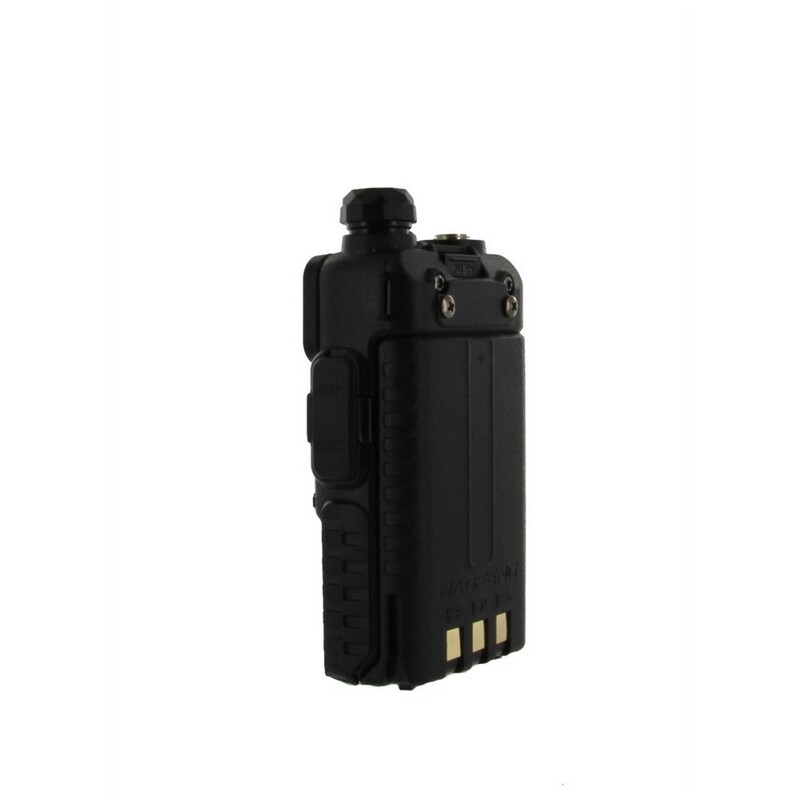 The Baofeng UV-5R comes with a rechargeable Li-Ion battery pack, belt clip, removable antenna, C-ring earpiece with in-line PTT microphone, drop-in batter charger, AC adapter, wrist strap, owner's manual and a one year manufacturer warranty from Baofeng. For your convenience, an optional USB programming cable is available to program the Baofeng UV-5R from a computer. I have set up a dozen or more of these for VHF-Marine and private frequencies; Only had one dud in the bunch, and 2-way Radios replaced it right away. They are loud, have great battery life, and work better than $200 radios. I ordered four radios. They came in a reasonable time frame. One radio was not threaded to receive the antenna, one only had 1/4 watt output, and the other two worked good. Taking into consideration the low cost of the radio and the fact that BTWR offered to repair or replace the two faulty units, which is in the process at this time, I am still giving them a positive grade. After all you get what you pay for. I'm a ham, so very useful for repeaters both bands. frs and murs frequencies do not require a license so very good for cruising and camping. receiver desensitizes when using another receiver for duplex, otherwise very good reception. dual watch very good. programming good with chirp. have 3 radios. dc adapter, so238 to antenna output , speaker mike all make a nice mobil unit. I am a ham, can use for repeaters. variable offsets meaning more or less then conventional splits. can set separate transmit pl frequencies for more than 1 input to repeater. no receive pl though. use also for FRS- GMRS, and am trying the MURS vhf freq band. so far very pleased with both radios. 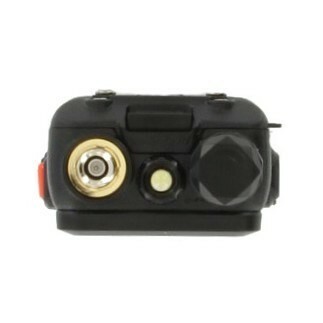 will replace defective Cobra FRS GMRS radio. no digital call tone. We use these radios mostly for VHF Marine and Weather, but also for private frequencies. They often outperform radios costing six times as much. They program well, and the battery life is terrific. I love the Uv5R radios!! Other than the menus and minimal instructions, and less-standard antenna connection, this is still a workable radio under most conditions. Buying it as part of Buy Two Way Radio's packaged set made even more sense as a particularly inexpensive entry into ham radio. New hams, in particular, should consider the package deal as it includes very useful stuff, especially the extra battery! 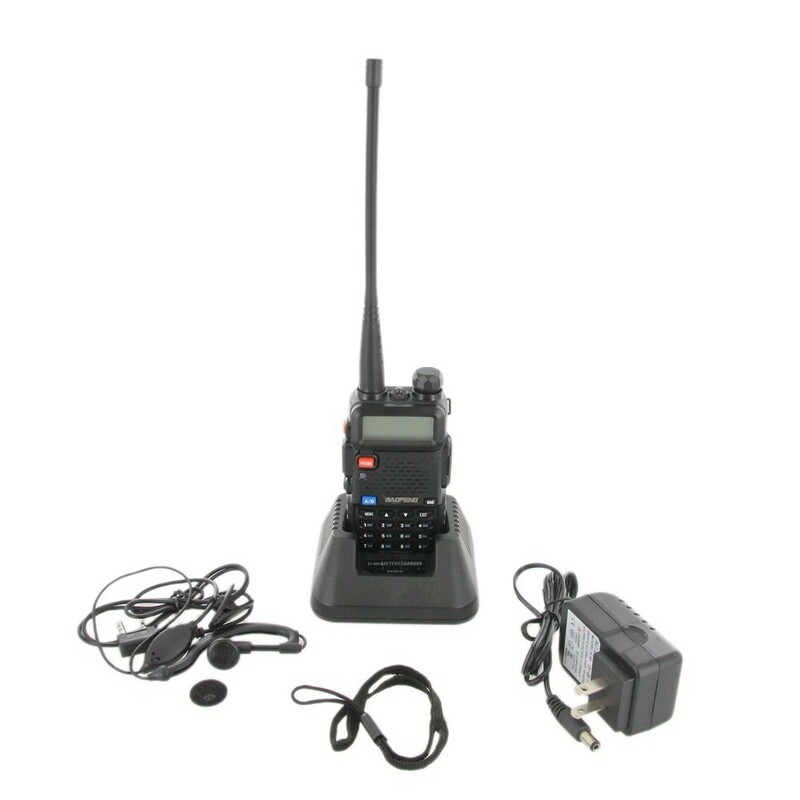 I have purchased and programmed nearly a dozen of these radios so far. Many of my friends who are not licensed amateurs simply want to use them as emergency service scanners, so I program them with the transmit capability turned off. I have also purchased several of them for first responders who want an alternative to their agency-issued Motorolas. For the price, they are virtually "disposable" so if they get lost or damaged on an emergency call, who cares? Just buy another. WE HAVE BOUGHT 11 OF THESE RADIO AND SO FAR THEY ARE DOING GOOD. THEY ARE DOING JUST WHAT WE WANTED. I use mine @ home. There is no provision for charging from d.c. I purchased the Baofeng UV-5R along with the latest firmware confirmation. The radio worker perfectly and handled the latest CHIRP software with no issues. 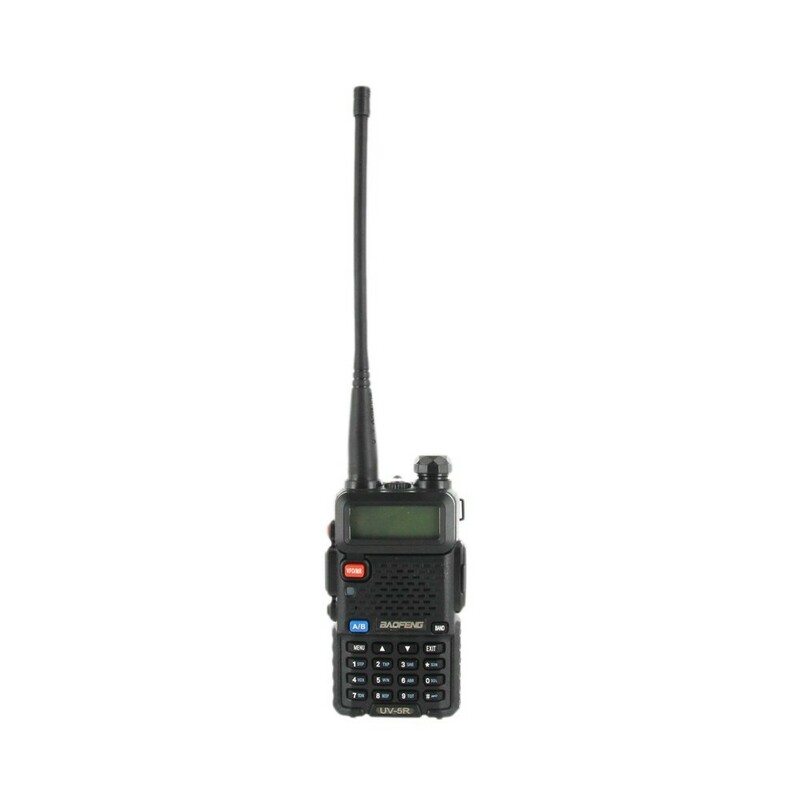 Their size, audio clarity and frequency versatility make these radios perfect for use in group activities where interoperability is required. A great improvement if they could be made "water resistant". I have a total of 4 of these now, with one being the 8 watt model. We first used these radios skiing and were impressed with the distances we could travel and still stay in touch. 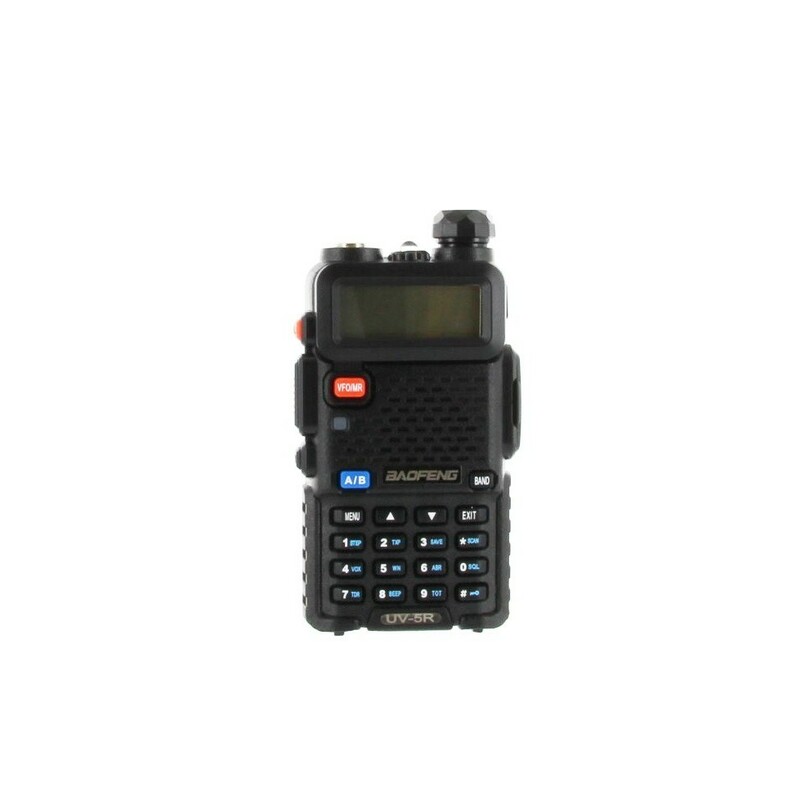 This is an impressive two-way radio for the price. I highly recommend it. Radio goes a long time in between charges, has clear sound on both ends, but a little garbled using earphone microphone. I get some intermittent static some time and not sure why. I wish you could program more than two channels without the computer software, but those are easy to do and change. Great little radios for a great price. Great ham radio! This is my second UV-5R but this one has a different firmware in it, updating many things and making the radio even better, the only problem I had was with the drop-in charger, the little plastic part that held it in, one on each side, well, it broke but a little of glue later...it is holding the radio in place again! 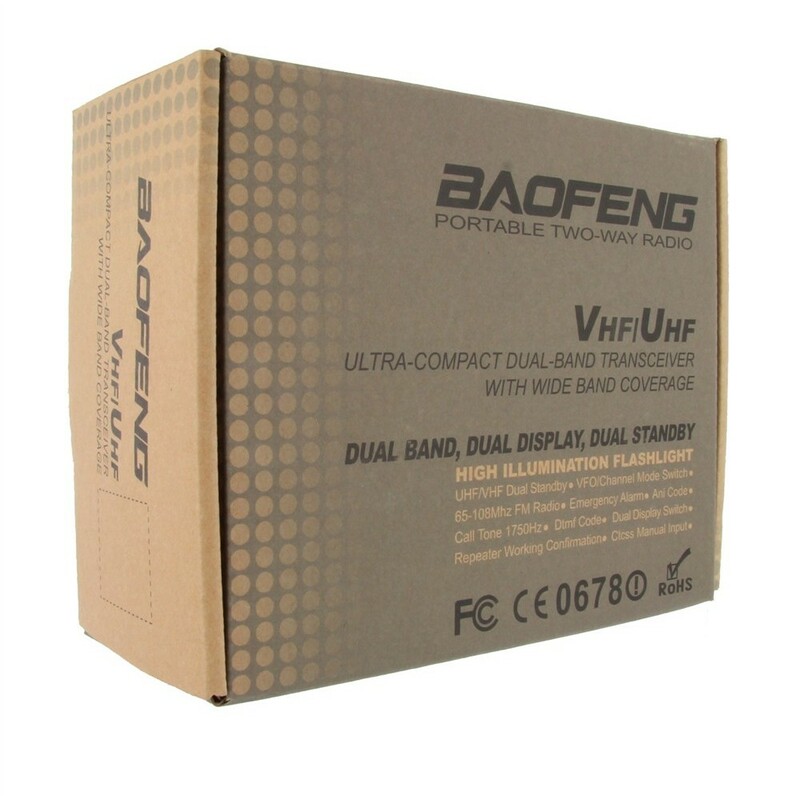 I have purchased two Baofeng UV-5Rs. As an amateur radio operator, I use these radios with local 2-meter repeaters for emergency exercises. I love their ability to be programmed by computer (with CHIRP software) and quickly set all radios to the same settings. The UV-5R was my first radio, after getting my FCC license. This little handy-talky helped me get started in amateur radio (I built my first antennas, began participating in local 2-meter nets and talking on radio, and started learning about optimizing radio signal propagation). Finally, the price makes these little handy-talkies a great value, so that I can afford to put one in every bug-out-bag. This little radio does all I expected and more. It came with everything I needed to get my "foot in the door". Had I known about this I would have bought it sooner. Now I need the USB cable and programming materials. I was surprised by how small the radios are. Unbelievable quality for the money. Great little radio. We all should know that you will not get any "usable" instructions with this radio. You can find really good instructions from a few dedicated people (on the web) that did the work to get the full potential from this radio. Mine also worked 100% with CHIRP software right out of the shoot. Use an original Baufeng cable...and save yourself the grief of trying to get things to work correctly. I also paid the extra $10 bucks to assure me a working radio with the latest firmware. The radio is so cheap...what's another ten bucks? Delivery was very prompt. Will probably buy another one of these from buytwowayradios.com. For the price.....why not? I gave it five stars because at this price we should just know that we may need to do a little "work" to learn the radio. I won't complain about the ridiculously worthless instructions, as some might. Purchased two radios. One from this vendor. Both work, but the radio from this vendor is flakey in that it programed ok but in function - if you change channels or switch from a/b you must turn the radio off and then on to receive or transmit. Works OK other than that. I gave the radio to a friend who programs radios for the local PD. He was unable to program it as a two way. I bought the program and the cable. I really wanted it for a scanner and a backup two way but now I just use it as a scanner. I could have sent it back but didn't want the hassle. It was a great price so I just use it as a scanner. I am satisfied. Best radio you can buy for the money. Comes with an upgraded Antenna. No need to upgrade. I've only had the radio for about a week, and it's working as promised. It's a great little, lightweight radio for the price. After downloading some aftermarket instructions, the programming went much faster and easier. I'd recommend this radio to any HAM looking for a small compact radio. Great Radios, simple, inexpensive, reliable, battery lasts forever. The Baofeng portable is very a ruggedly built portable. it has great reception and seems to be able to handle what ever is thrown at it. I use one along with others and they keep on working well in all kind of conditions. I use them on the trail when i am out riding and that is dusty hot rainy conditions. the audio is very good to excellent. then range is surprising good from such a small package. I own several of them and they all are working just fine. I do find that the battery doesnt quite last as long as advertised but you can work around that. other wise it is a big bang for the buck..
the instructions are vague and hard to understand. It lacks ease of being able to programmed with a simple stroke. It is confusing to have to go back and forth between channels and frequencies to program the radio. Also the antenna connector should be a bnc instead of the one that is on it. And it could do with out the gimmick like the flash light and siren. What does that have to do with a two way radio anyway.?? Visit us at the 61st annual Rock Hill Hamfest! It's World Amateur Radio Day!